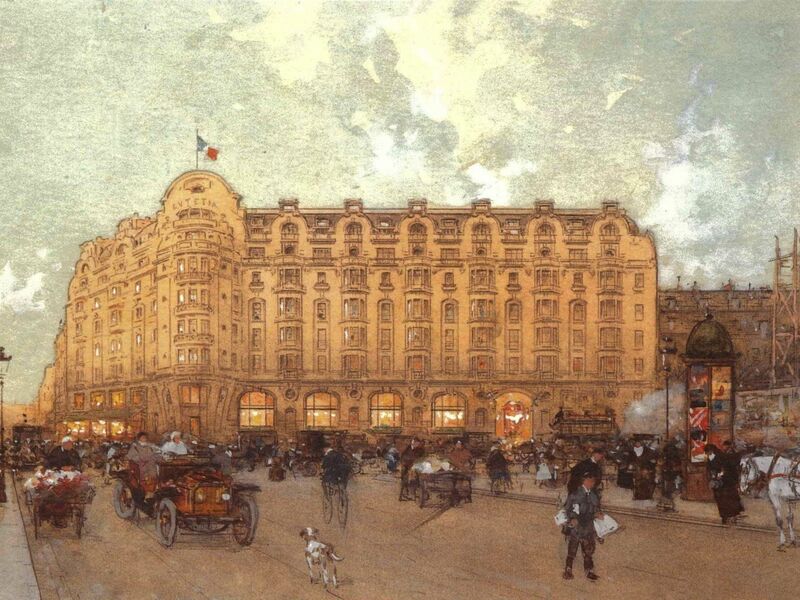 Opened in 1910 on the initiative of the Advisory board of the department store “Le Bon Marché” for their important clients, the Lutetia hotel is significant in the history of Paris for being a transition from the Art Nouveau of the day to the then emerging style of Art Deco. The Hotel is located at 45 Boulevard Raspail, in the Saint-Germain-des-Prés area of the 6th arrondissement of Paris, one of the best-known hotels in the history of Paris on the Left Bank. The architects at the time, commissioned sculptor Léon Binet and later, Paul Belmondo (father of actor, Jean-Paul Belmondo) to decorate the hotel’s facade in the ‘Art Nouveau’ style comprising branch-like depictions with imposing floral details intermingling with grape vines and grape clusters. The Lutetia quickly became a place where the anonymous could be found alongside the famous, where art, philosophy, science and politics were continually created, discreetly and without ostentation. A place of intellect; a place of experiment, gifted for creating and developing ideas. Shortly after the Lutetia opened, its early success was interrupted by the First World War and later again in June 1940, when the French government evacuated the occupied city. The hotel itself (like other Palace Hotels in Paris) was requisitioned during the Second World War by the occupation forces and used to house, feed, and entertain the troops and officers. In 1944, the Lutetia resumed its intended role and at the orders of General de Gaulle, the hotel became a crucial centre for displaced people and families seeking to be reunited with their loved ones. The hotel welcomed up to 2,000 arrivals each day. The Left Bank is known for its nurturing of bold advances in literature, painting, sculpture and dance, and all of them found a home at Lutetia. Originally most associated with literature, just some of the historical and culturally significant figures who lived, worked and entertained at the hotel include Andre Gide and James Joyce who wrote "Ulysses" at the hotel with Ernest Hemingway acting as occasional editor, Samuel Beckett, André Malraux and Saint-Exupéry followed. This was just as true for the other arts. Picasso and Matisse took up residence, Josephine Baker was a regular, and during the 50’s and beyond the hotel and its bar became a key part of the emergence and celebration of jazz. 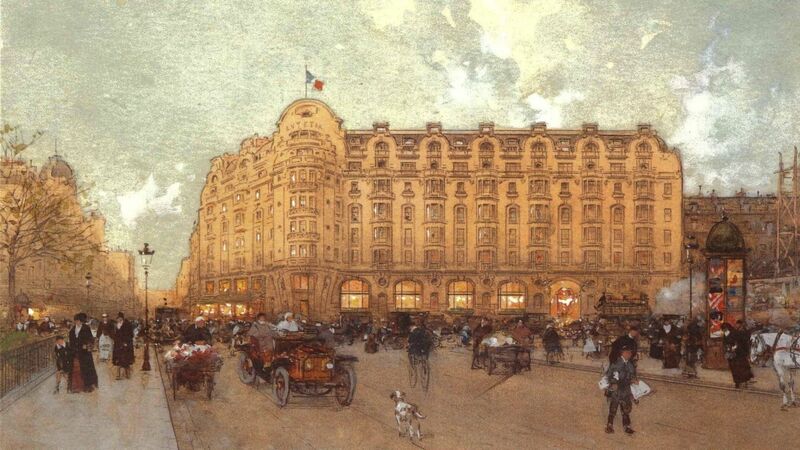 Also raising a glass in that famous bar, are the hotel's new owners at the time, the Taittinger family. Like the famed champagne that bears their name, the Lutetia is now a favourite of a new generation of business, government and cultural leaders. De Gaulle, then a young officer spent his honeymoon at the hotel. In June 1940, the General slept there the night before his departure for England. He forgot a trunk which was stored in the basement until the Liberation. François Mitterrand was also a frequent visitor as was Albert Cohen, living at the Lutetia while writing his masterpiece “Belle du Seigneur”. Pierre Assouline’s novel Lutetia from 2005 takes place in the hotel, where he gives life to a vast number of characters that really have lived or stayed in the Lutetia during the war from 1938 to 1945. At he beginning of 2009, the businessman Pierre Bergé - a French industrialist and patron- stayed a few months at the Lutetia during his house renovation. He previously lived for several years at the Lutetia in a suite especially decorated for him. He is the co-founder of Yves Saint Laurent Couture House. Sonia Rykiel redesigned the property in the 1980s with sculptor Arman creating their own suites. David Lynch was also a Lutetia’s habitué, and his suite is on the first floor of the building, that houses his creations. However, the famous Lynch’s “dark side” doesn’t make part of the atmosphere of the suite, since he kept the art deco style of the hotel by setting clear, soft and cozy designs. During the 50’s, in a city - and a hotel - celebrating its freedom, the soundtrack that opens the era is jazz. The Lutetia is once more the venue for artistic collaboration. Sometimes, accomplished musicians like the actor Andy Garcia, a guest at the hotel, sits in front of the keyboard and would play into the night as much for his own pleasure as for other night birds. At the end of the 1950’s, Juliette Greco met another great French artist, equally loyal to the hotel: Serge Gainsbourg. When he died, Eddy Mitchell composed a blues song which is a signature music of the hotel. As one of the finest hotel’s in the history of Paris, classic and contemporary lives side by side and the latest stars to adopt the Lutetia find inspiration in the hotel's storied past. This is the key to fashion icon Sonia Rykiel's redesign in the '80s. Starting with her own shop in the hotel, she goes on to reclaim the Lutetia's art deco heritage in the rooms, brasserie and Michelin-starred restaurant. Not to be outdone, guests from sculptor Hiquily to filmmaker David Lynch design their own suites. The largest of these is, not surprisingly, by Arman, celebrated creator of monumental sculptures. It becomes his pied-a-terre for two months of each year, when he comes to Paris to oversee his foundry.